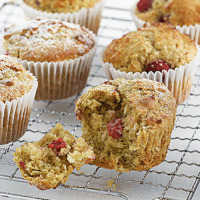 Serve these sweet, berry-filled buns in lunch boxes, at picnics or as a treat for afternoon tea. Sieve in the baking powder, bicarbonate of soda and the flour. Use a large spoon to combine very gently. Don't overbeat the mix at this stage or the buns will be heavy. Try adding other fruits such as blueberries, banana or rhubarb, depending on the season, or use frozen raspberries. Serve warm with ice cream for an indulgent summer dessert. A glass of fizz would be perfect with these soft, fruity buns.